Que vous preniez des photos pour les médias imprimés ou les médias sociaux, capturez des images brillantes de falaises écarlates, de ciel bleu et de flore du désert étouffée lors de cette visite privée en photo de Red Rock Canyon, à quelques minutes de Las Vegas. Votre guide personnel connaît tous les meilleurs points de vue pour capturer des paysages et des selfies, et peut également vous révéler les secrets de la région. Inutile de dire que votre journée comprend des transferts privés aller-retour porte-à-porte. The photo tour of red rock Canyon was absolutely awesome. Paul is a great host. 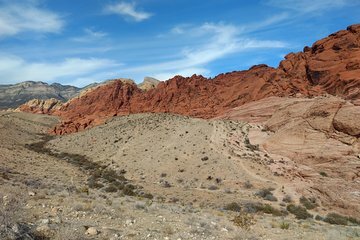 We were picked up on time in a new clean van and brought out to red rock Canyon where Paul showed us several photo vantage points. It’s a beautiful canyon and well worth the tour. Awesome all around. The guide, Paul was the nicest guy you will ever find. And the scenery was breathtaking. Beautiful, Beautiful place and so glad we went. Our guide Paul was awesome. He knew all about the area, the history and and all the best spots. The kids loved climbing on the rocks and could have done it all day! Just gorgeous there. We recommend Paul for all his tours. What a great day. Paul was an awesome tour guide. He followed through with the tour, even though I was the only one who signed up. He picked me up and dropped me off right at the hotel, and his communication was thorough and timely. He knew when to get to the park to be sure we got in, explained many interesting facts about the landscape, and was generally great to adventure with. We also got to hike more than usual since it was just us two, which was a blast. Highly recommend!